I'm returning to the Victoria and Albert museum this December to teach one of my projects from 'Embroidery: A Maker's Guide' with the V&A. We will be working this Opus Anglicanum Green Man embroidery so get in quickly to book your place as they go quickly! Our new class, 'Spring' is here! 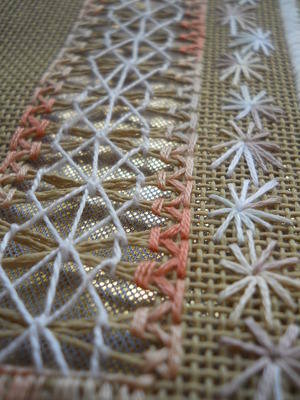 Stitch this beautiful Jacobean inspired project along with Sarah. With over 7 hours of HD video, a beautiful materials set, accompanying instruction booklet, 1 year of access to the videos (so stitch in your own time, at your own pace in the middle of the nighttime if you want to!) and feedback whenever you need it from a Royal School of Needlework apprenticeship trained tutor, we think this is the finest value for money Distance Learning class on the market! This kit is back in stock, get yours here!